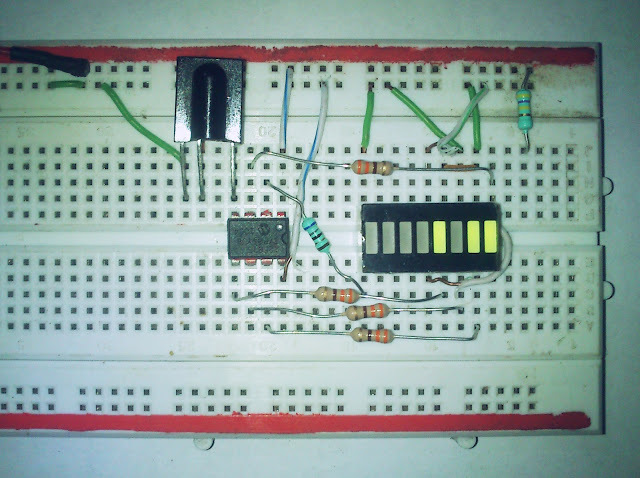 This little project will demonstrate how you can use your old NEC IR protocol based TV,DVD or VCR remote control to control you home appliances like fan bulb or virtually anything. 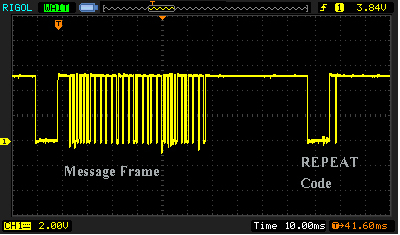 Final 562.5µs pulse burst to show end of message transmission. 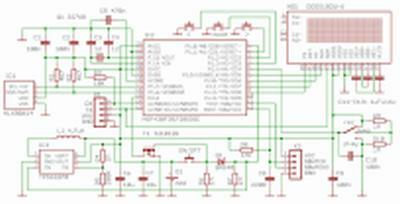 There are four bytes of data bits are being sended in least significant bit first order the figure blow shows the format of an NEC IR transmission frame, for a command of 0xB1 (10110001b) and an address of 0x8D (10001101b) . 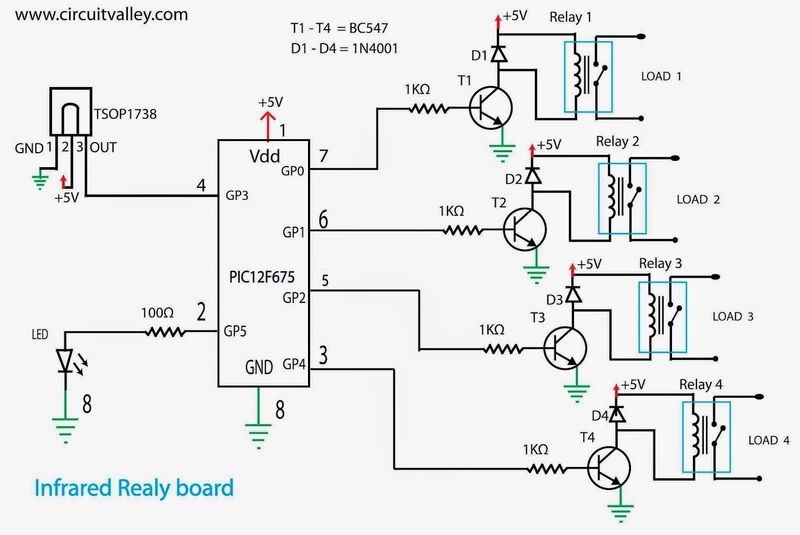 16 bits for the address (address + inverse) require 27ms to transmit time .and the 16 bits for the command (command + inverse) also require 27ms to transmit time. because (address + address inverse) or (command+command inverse) will always contain 8 ‘0’s and 8 ‘1’s so (8 * 1.125ms) + (8 * 2.25ms) == 27 ms .
according to this total time required to transmit the frame is (9ms +4.5ms +27ms+27ms) = 67.5 ms. The NEC protocol is so widely used that soon all possible addresses were used up. By sacrificing the address redundancy the address range was extended from 256 possible values to approximately 65000 different values. 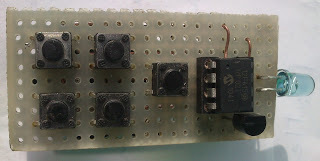 This way the address range was extended from 8 bits to 16 bits without changing any other property of the protocol. The command redundancy is still preserved. Therefore each address can still handle 256 different commands.in extended protocol instead of sending address and address inverse we send address low and address high as shown in the image blow. 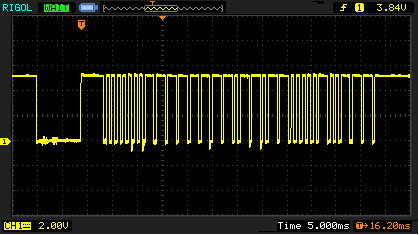 A 562.5µs pulse burst to mark the end of the space (and hence end of the transmitted repeat code). 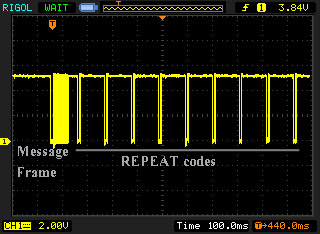 Decoding NEC is really easy ,there are certainly various methods to do, some examples i have see n used polling method in which the firmware keep polling the input pin of microcontroller which connects to IR sensor , other method is to user interrupt ,in this demonstration we will be using the interrupt method as this one is better, we will be using interrupt on change. 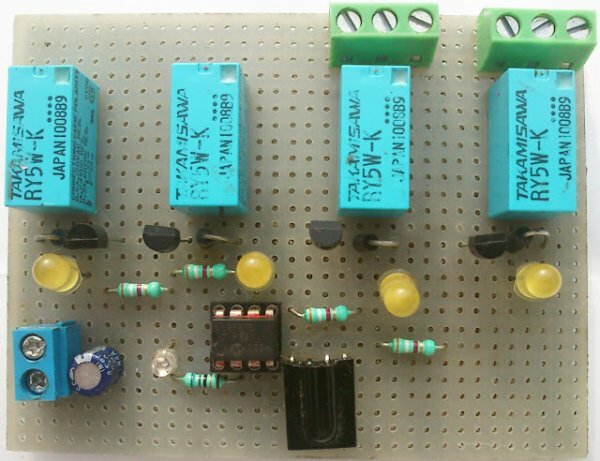 Because of power supply , Decoupling capacitor 100nF and 10uF is recommended on pin 1 and GND , as point out by readers.